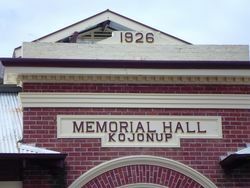 The Kojonup Memorial Hall was built in 1926 in memory of those who died in service or were killed in action in World War One. The foyer features an stained glass ceiling and a marble scroll of honour bearing the names of the fallen and the local governing body. The official opening which was performed by Major-General Sir Talbot Hobbs took place in front of more than 1000 people. The building was completed at a cost of £5000 which had been entirely subscribed by the people of the district. The West Australian (Perth) 21st August 1926.